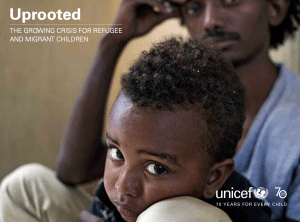 Uprooted: Around the world, nearly 50 million children have migrated across borders or been forcibly displaced. This report presents – for the first time – comprehensive, global data about these children – where they are born, where they move and some of the dangers they face along the way. The report sheds light on the truly global nature of childhood migration and displacement, highlighting challenges faced by child migrants and refugees in every region.